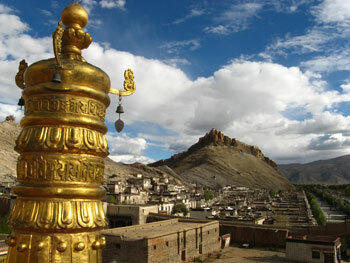 Lhasa-Gyantse-Shigatse tour package is the "Golden Route" of Tibet tours. If you stay in Lhasa, you can only get a little taste of Tibet's majesty, charm and diversity. The "Golden Route" will show you most of the real highlights of Tibet travel: the unique overland landscapes, the snow-covered mountains, plateau lakes, more and different monasteries and the chance to get close to the real people of Tibet. After Breakfast visit Potala Potala, which was originally constructed in 637 by Songtsen Gampo, the first king of the united Tibet, and later expanded and served as the winter residence of the Dalai Lamas as well as the religious-political nexus of traditional Tibet. In the afternoon visit Jokhang temple, the center of the Tibetan Buddhism and the sacred land of Buddhist followers where innumerable pilgrims come for worship everyday. The temple, built in 647, is the earliest wood-and-masonry structure still existing in Tibet. Surrounding the Jokhang Temple is the bustling Barkhor Market place which is the religious and social focus of Lhasa. Overnight at hotel. After breakfast visit Drepung monastery the sacred land of Gelukpa sect., which was creaYamdroke Laketed in 1416 and the second, third and fourth Dalai Lama once resided in. In the afternoon visit Sera monastery, which was created in 1419 and has always been an important Buddhist seminary. As rose are planted everywhere in the monastery, it is also called "the court of wild rose". Today still 200 lamas live in there. Overnight at hotel. In the early morning transfer to airport and fly back to Chengdu/Beijing/Kathmandu.